It's been since May that we've sent a newsletter, and you may have been wondering if we had forgotten about you. We haven't forgotten you - we've just been busy! We hope that you'll stop by and browse our web site! In this issue, we remind you of our discount on molds, and tell you about the second in a series of articles being run in Doll Maker magazine. Act today! Don't miss out on this great opportunity. All mold purchases made by November 30 on our web site will automatically receive a 30% discount. The price displayed in our store reflects this discount. 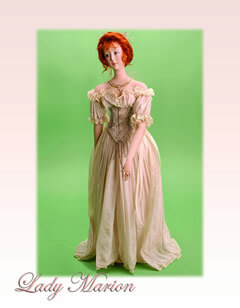 Part two of Judith Moore's series on Lady Marion is now featured in the Fall 2002 issue of Doll Maker magazine. Also, read Lady Marion's journal, as recorded by Kathleen Honzik. Follow Lady Marion's romance with Benjamin Farnsworth during Victorian Times. Benjamin is poured from our Lord Christpher mold. In the Summer 2002 issue, Judith wrote about the Rochard method of doing a pearl neclace. If this was forwarded to you by a friend, and you would like to know more about Lincoln Mold Company or Betty Bailey Originals, please visit http://lincoln-mold.com and subscribe!